Silver bullion coin investors buying silver coins for their silver bullion and investment portfolios might look to obtain the latest and most pristine silver bullion coins available. Kitco’s exclusive MintFirst™ program provides you direct access to 20 freshly minted Silver Eagle Coins in US Mint Tubes with the assurance that you are the first one to appreciate the luster and detail of your newly minted 2019 1 oz Silver American Eagle Coins. You can be confident that the MintFirst™ Silver Eagle Coins delivered to you are in the same impeccable condition as when they left the United States Mint’s Silver Eagle Coin minting facility. Affordability, credibility, and beauty are the attributes that have made the 1 oz Silver American Eagle the world's all-time bestselling silver bullion coins. Over 500 million of these Silver Eagle Coins have been struck and sold since their first issuance by the US Mint in 1986. The design of the American Silver Eagle Coin’s obverse surface, upon which the year of mintage is inscribed, is based on Adolph A. Weinman's "Walking Liberty" half dollar that was introduced in 1917 and is widely considered one of the most beautiful American silver coins ever minted. In addition to the American Silver Eagle Coin’s 1 oz weight and $1 USD face value, an eagle and a shield appear on the reverse surface of this silver bullion coin to symbolize American strength and pride. The US Mint was placed under the Treasurer of the United States in 1981. Currently headquartered in Washington D.C., the US Mint operates manufacturing facilities in Philadelphia, Denver, San Francisco and West Point and a famed gold depository at Fort Knox. Today, the US Mint produces all US legal tender and official silver bullion coins solely for the Treasury's account. Why buy Silver Eagle Coins MintFirst™ from Kitco? Kitco is a trusted leader in the silver bullion coin and physical precious metals industry. 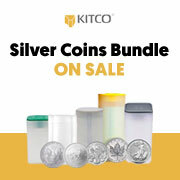 Silver and other precious metals sold by Kitco are recognized in silver bullion coin markets around the world. With our focus on silver bullion, you can benefit from our low silver coin prices and premiums that are highly competitive in the silver bullion coin industry. We strive to make managing your tangible wealth both safe and easy. You can sell or buy silver coins and other physical precious metal items using our convenient online store, or by contacting our team of highly trained precious metals specialists. Backed by our global information network, Kitco has been proudly serving our customers since 1977.